This is an extraordinary and extremely rare hand colored large format sea chart or map depicting southeastern Long Island, New York. Details part of Suffolk county from Moriches Bay to Napeague Harbor, including the summer getaways of Sag Harbor, East Hampton, Southampton (South Hampton), Quogue, Bridgehampton and Amagansett, among others. Extends as far north as Gardiner's Island and Hog Neck. Inland regions are depicted in considerable detail, down to individual buildings. In addition to inland details, this chart contains a wealth of practical information for the mariner from oceanic depths, to harbors and navigation tips on important channels. Two views decorate the bottom of the map, one depicting about 9 miles of coast south of Speonk, and another depicting the coast south of Shinnecock. The hand color work on this beautiful map is exceptionally well done. This map was created under the direction of A. D. Bache, Superintendent of the Survey of the Coast of the United States and one of the most influential American cartographers of the 19th century. 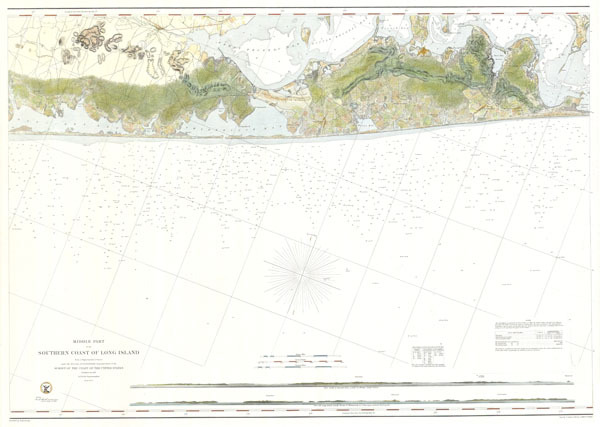 This is one of the rarest coast chart's out there and one of the best maps of Long Island to appear in the 19th century. Report of the Superintendant of the U.S. Coast Survey, (1856 edition). Very good condition. Wide clean margins. Blank on verso.